Carlsbad, CA (June 22, 2015) – SynergEyes®, Inc., the worldwide leader in hybrid contact lens technology, is excited to announce the nationwide availability of UltraHealth® FC, a new hybrid lens in an oblate design. Combining exceptional gas permeable optics with SoftCushion™ comfort technology, this hybrid lens is indicated for post-refractive surgery patients. The UltraHealth FC lens has a reverse geometry vaulted lens design and includes a 130 Dk GP center, and an 84 Dk silicone hydrogel skirt that offers oxygen permeability, enhanced tear exchange and lens movement. 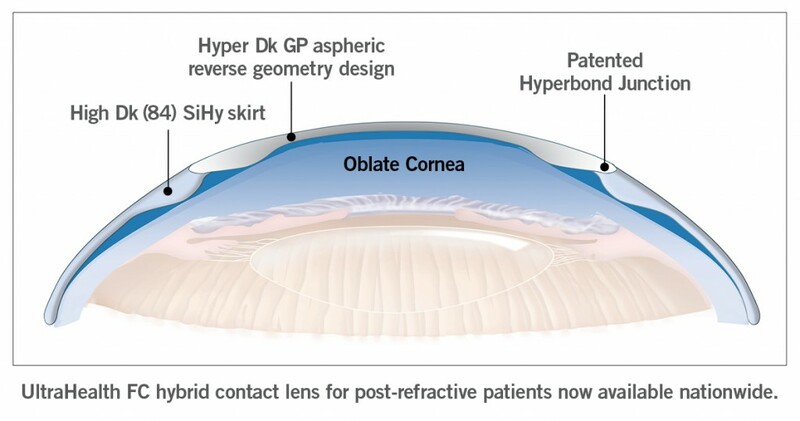 Design and material advances in hybrid contact lens technology are now available for patients with flatter corneas who are looking for an improved visual outcome. Patient case studies from independent eye care professionals are available at SynergEyes.com/Professional. Here are two quotes from practitioners who have been actively prescribing the new UltraHealth FC lens. “The patient reported almost immediate comfort and dramatically improved vision after insertion of the UltraHealth FC lens” said Ryan McKinnis, O.D., FAAO, Optometrist, Cleveland Eye Clinic in Brecksville, OH. For more information on UltraHealth FC visit SynergEyes booth 907 at AOA Optometry’s Meeting in Seattle June 24-28, 2015, or go to SynergEyes.com/Professional.